If you have a retail business, surely you wouldn’t be standing inside your store with the lights turned off, all alone, would you? That is what your computer is, without a network to back it. Networks allow ease of communication, collaboration, and sales. Data Link Professionals can help you roll out a new network for your startup business, or simply analyze and rebuild your current network. We use the top components from the best manufacturers in the world…. 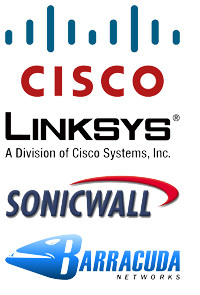 Cisco, Linksys, Sonicwall, Barracuda, HP, and many more. DLP can help setup a point to point connection with your offices, or reduce your costs by implementing a hub and spoke vpn network throughout your stores and mobile workforce. Moving into the wireless age? DLP can assist you in both local area wireless networks and remote broadband solutions for those workers on the go. No job is too large… or too small. Contact DLP today to see how we can help you.